Chinese sausages are cured and often made of pork but can be made of chicken or an assortment of livers. They are mildly sweet, and have an aromatic flavour of rice wine and used very commonly in Chinese cuisines. Chinese sausage is a staple in most Chinese households. They are quite versatile as they can be used in almost any kind of dishes from stir-fries to steamed dishes. They are most commonly steamed with white rice or mixed in with sticky rice dishes. They also pair very well with all types of vegetables and can be added to stir fries as well. Everyone has a different preference when it comes to Chinese sausage 🙂 Some like them fattier for more flavour, and some like it a bit more leaner to keep things healthy – they come both fatty and lean but to find which one is which is best suited to you, I find you have to try all the different kinds of brands and until you find your favourite. You can find these noodles in Asian grocery stores most commonly in the refrigerated section although we have occasionally found these not refrigerated around the aisles as well.They usually come vacuumed sealed in a bundled package of 10 or more. If you have a more old school Asian supermarket around you, you can sometimes see these hanging around individually on strings (not packaged) and sold individually. They usually provide scissors around the area for you to clip the strings they are hanging from. These sausages are slightly sweet and salty with flavours of rice wine. Chinese sausages made with liver have that same sweet and salty flavour with a liver flavour. 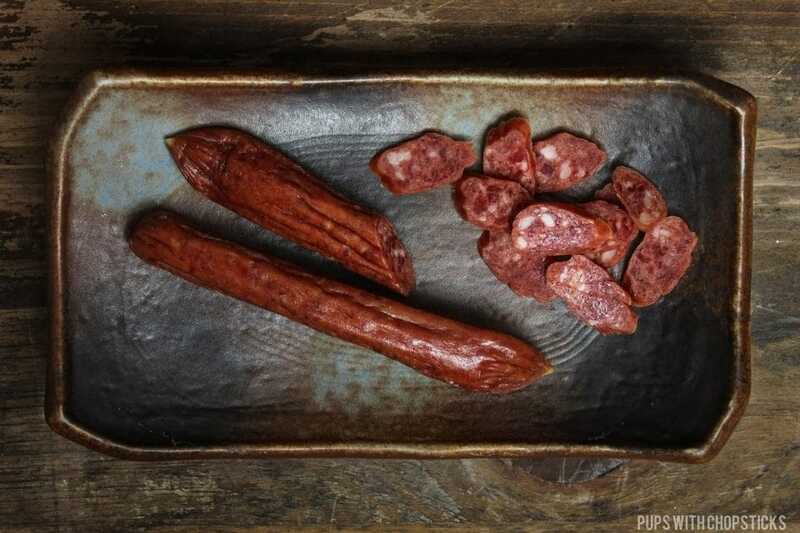 Chinese sausages are cured and dried which give it a very dry and tough texture. When reconstituted through steaming or cooking with a bit of liquid they become slightly softer but still maintain its shape and form. Sausages made with liver, have a softer and drier consistency – pretty much the same texture as liver with a bit more shape and moisture. These things last quite a long time when stored in the refrigerator. Just make sure to check for any mold or funky sour smells before using it if you have had them in the fridge for too long – and when I say long, I mean more than a year old. Yeap, I’ve had them around for that long with no issues. Keep them well sealed as well, I have had experience of these sausages absorbing the refrigerator smells from not keeping them well sealed – kinda gross really 😛 If you’re unsure, you can slice off a tiny piece to try before using it.